At the beginning of the year I’d never been for an afternoon tea but 2018 has seen me go for three different ones. My second afternoon tea of the year took me to Aqua at the Shard in London, which was also my first visit to the Shard, where I enjoyed a Mary Poppins themed afternoon tea. It is held on the 31st floor where you are met by glass windows all around which gives you a wonderful view of London that lasts for miles. There are some tables situated in the window which we were lucky to be seated at. 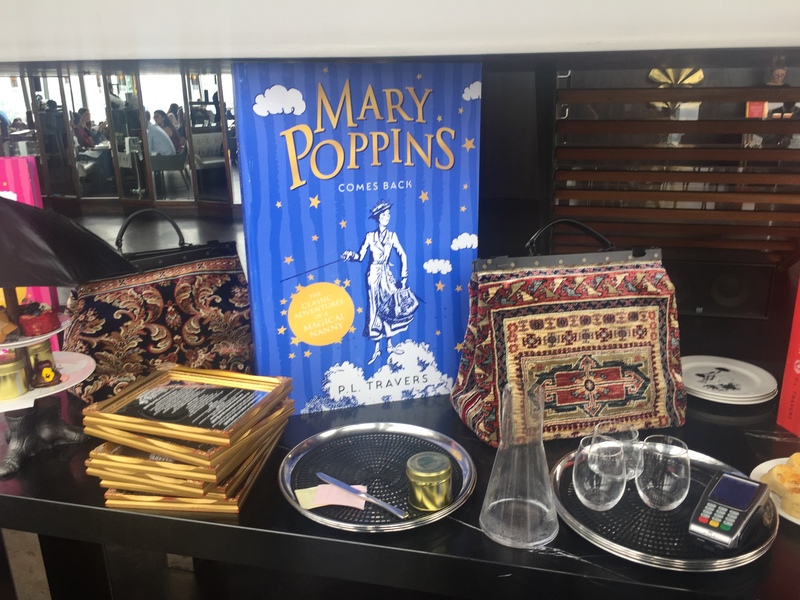 Mary Poppins afternoon tea is inspired by the books written by P.L Travers which Harper Collins have relaunched as well as a movie to be released later this year. Once seated you are given a menu which comes on a gold framed mirror reflecting on Mary’s vanity and practically perfect reflection. On the table you will find crockery that has taken inspiration from Mary Poppins as you find a plate with a picture of Mary flying with her umbrella as well as cup with a picture of an umbrella. Bert’s Tea – a sweet and smokey tea with a blend of souchong, keemun, ceylon, vanilla flavouring and cornflour. I opted for Mary’s tea which was lovely especially as I am someone who doesn’t like tea normally. Both my Mum and I decided not to add some fizz but we did see some people take this option. A custom made stand is brought to your table with your savoury and sweet treats. The stand comes with an umbrella located at the top and then on the bottom you can find a pair of boots. On a separate plate you will find some homemade scones with jam and cream which we took home as we were too full from from the sweet treats and sandwiches. In the restaurant area there is also a stand serving some fairground candy floss in a raspberry flavour with popping candy. You can find the staff members dressed in costume relating to Mary Poppins. For anyone who is a fan of the books or original movie this afternoon tea is a must visit.